If you are ready to take your link building to the next level, read on to find out: how common backlinks can improve your traffic, why some common backlinks are more powerful than others, how to find common backlinks that are expected in your niche and how to find common backlinks that your competitors have, but you don’t. Our article Who are your neighbors in the link building world stressed the importance of belonging to a good neighborhood and avoiding bad ones. But what makes a neighborhood good or bad when it comes to link building? The answer is: co-citations - a really important ranking factor for Google. The search engine identifies a relation (or link) between two websites based on a third-party webpage that mentions both websites. Co-citation refers to link building without it necessarily involving actual outgoing links. They make search engines understand what other sites your site is similar to. In this article we look at the backlinks that your competitors have and find out how to use the good ones to increase your website's authority and relevance in SERPs. 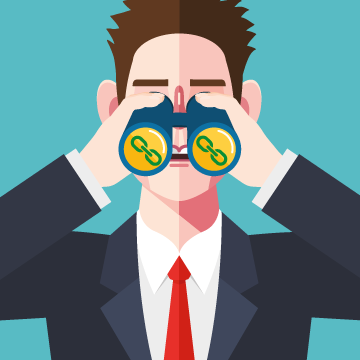 How to find common backlinks that your competitors have, but you don’t. Customers choose businesses in this niche based on location, price and availability. I wouldn't imagine that a great deal of SEO work has been done on these sites. It's not a highly competitive niche, like car insurance for example. To avoid sites like Wikipedia being involved I chose the slightly less general keyword ‘horse riding london’. I don’t live in the UK so I needed to simulate being in London. 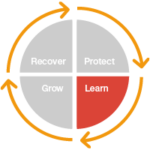 I often use the Chrome Extension by Redfly Ltd called SEO Global For Google Search™. This is a very handy browser extension for checking what search results would look like in different countries. 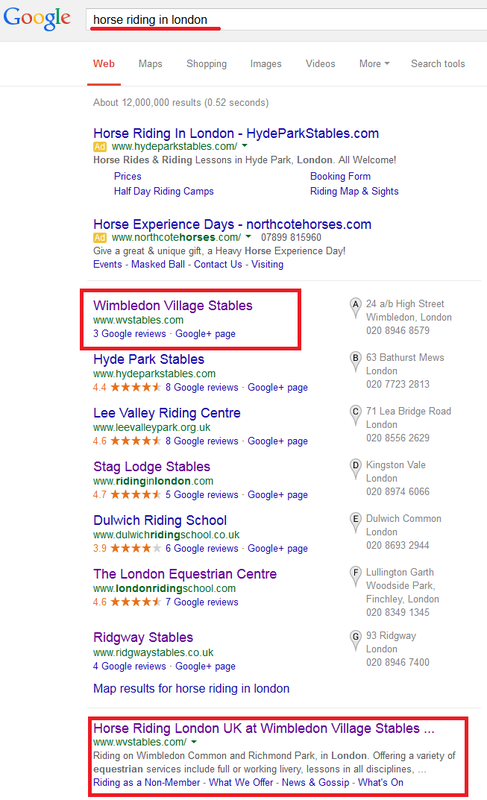 It’s interesting to note that wvstables.com is top of the organic listings as well as top of the ‘Google Local 7 Pack’. The local listing is particularly interesting as the winner, Wimbledon Village Stables has just 3 Google reviews, whereas the others have 5, 6, 7 and 8 reviews. At the moment we are looking at one keyword, ‘horse riding london’. If you need to rank for one particular keyword then your competitors are certainly going to be the other domains that are listed on the first page of Google. As we are trying to determine if common backlinks are going to be beneficial to your domain it might make more sense to consider more keywords that your domain is ranking for. I really love the service provided by SEMRush for analyzing traffic and ranking data. SEMRush has a metric called ‘Competition level’ which is based on the analysis of the number of keywords of each domain, and the number of the domains and common keywords. If the domains have a high number of common keywords, they could be considered competitors. One thing that sometimes causes confusion, when looking at organic search positions, is the Traffic Cost. SEMRush can analyse paid traffic as well as organic. Traffic Cost is the estimated cost for visitors coming to a site organically, based on the cost of the same number of visitors generated through ads. With my own sites I have found this to be fairly accurate, with the SEMRush traffic cost being at least within the same order of magnitude as the cost of paid traffic. 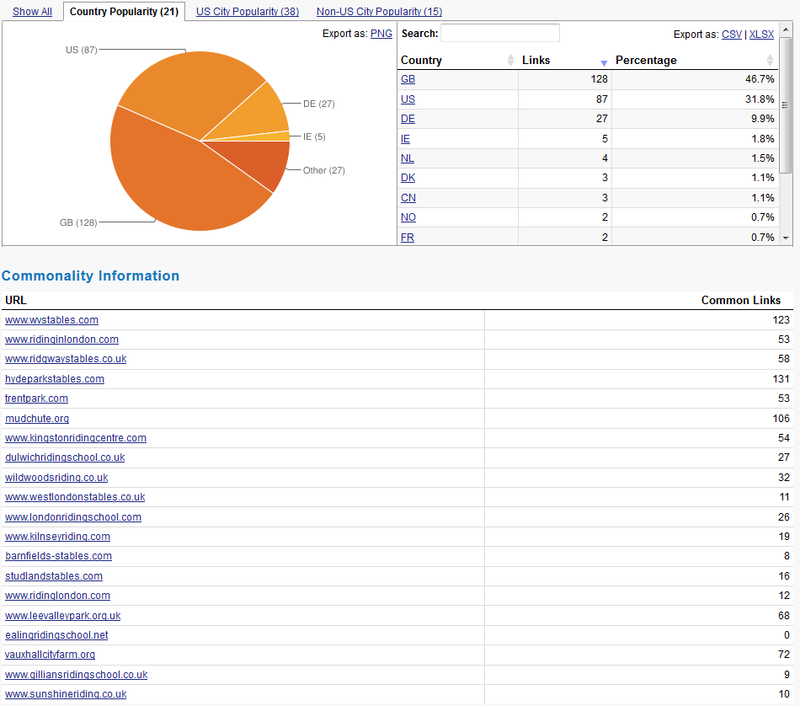 Using SEMRush we can find the top 20 domains that are competitors, based on the SEMRush metric 'Competition level'. In the table below we can also see the number of common keywords that they rank for and the number of keywords that they rank for in Google’s Top 20. The SE Traffic metric is also shown, which gives us an idea of the level of monthly organic traffic. 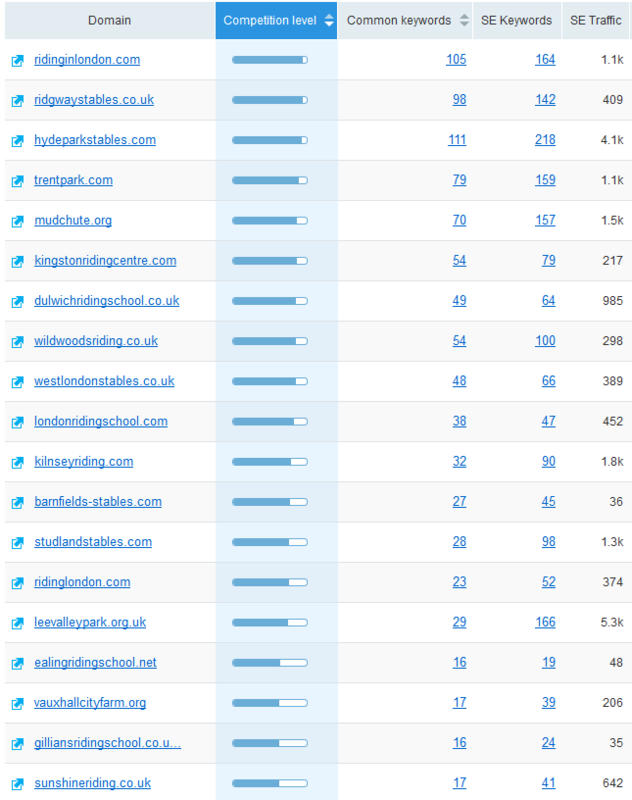 As you would expect the competition seems to be mostly riding schools, but some are not, such as leevalleypark.org.uk. 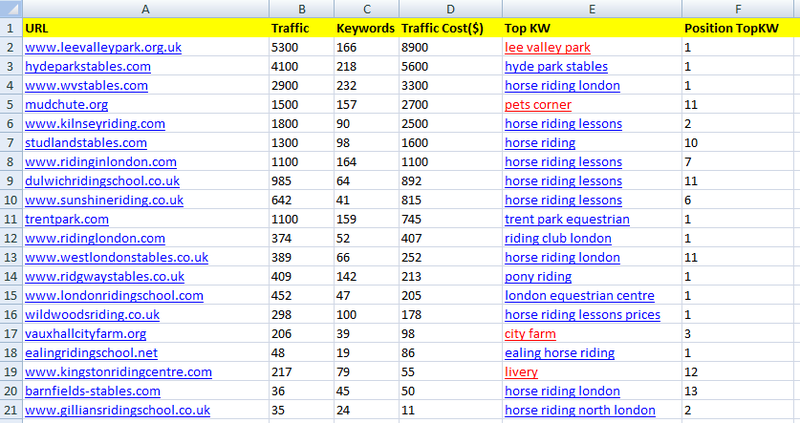 If we are looking for a correlation between common backlinks and a domain's SERP performance it may not make sense to include sites that are not dedicated to horse riding. The keywords in red are not directly related to horse riding so they might not be so relevant. The top example is Lee Valley Park. Lee Valley Park is a large regional park in the north east of London with a diverse mixture of countryside areas, urban green spaces, heritage sites, country parks, nature reserves, lakes, riverside trails, and sports centres. Kingston Riding Centre is another example where they offer horse riding and lessons, but much of their business seems to be focused on horse livery stables (aka boarding stables in the US and Australia). 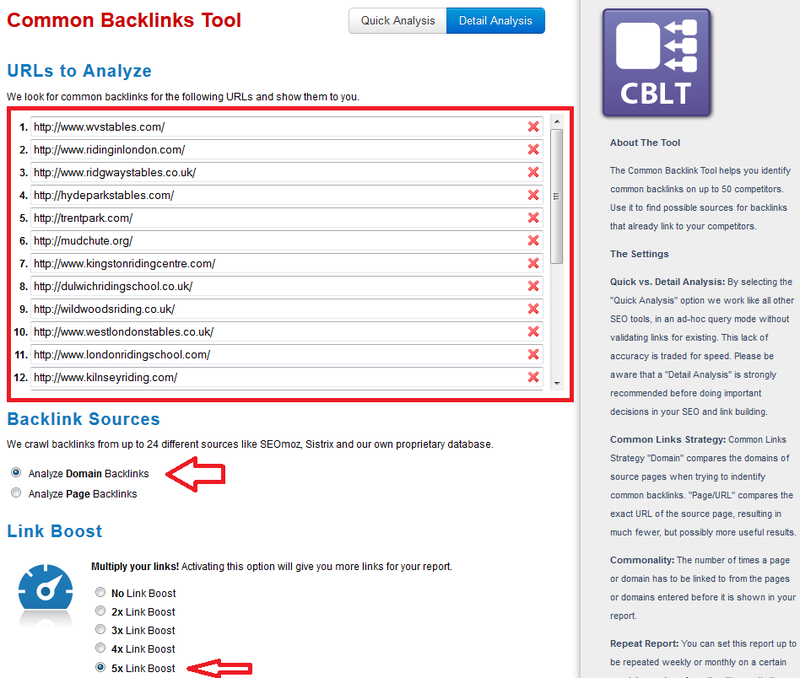 The LinkResearchTools Common Backlinks Tool (CBLT) can be used for up to 50 competitors. It is most commonly used to find possible backlink sources that are already linking to your competitors. For the moment we just want to prove that these common backlinks are necessary. Although Common Backlinks Tool is a complex tool, it is extremely easy to use. In our case we can take the list of domains straight from the Excel spreadsheet and paste them into the Common Backlinks Tool. 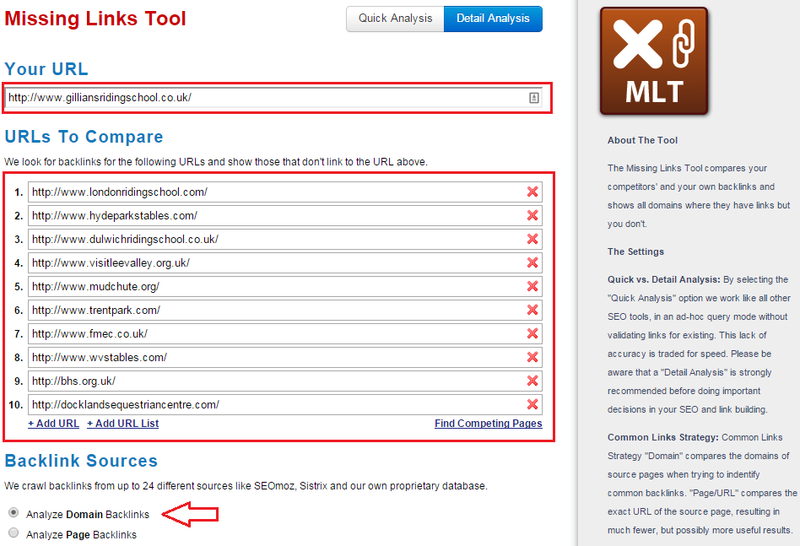 We want to analyze the domains rather than pages, so we select ‘Analyze Domain Backlinks’. I usually like to see as many links as possible in the report so I also select the ‘5x Link Boost’ too. In the pie chart we can see that the most popular linking country is the UK with 46.7% of the links, with the US second at 31.8%. This is exactly what I would expect for the UK based horse riding niche. Without further analysis I think you would agree that common backlinks are an important signal for the relevance of a domain. Before we move on, let us take a look at two of the exceptions to the trend in the above spreadsheet. Looking in the $/CL column we can see the domains that are performing the best and worst, by looking at their number of common backlinks divided by their estimated traffic cost. I’m going to ignore the ones with the red keywords, because I want to focus on the sites that are specifically about horse riding. Let us assume for the moment that some of the most important links that a site has are the common backlinks. In this case we would expect to see a huge discrepancy between the best link of KilnseyRiding.com and the best link of GilliansRidingSchool.co.uk. From the grid of the Common Backlinks Tool we can click any point to launch a QBL report which will tell us more about the relationships between the link and the chosen domain. 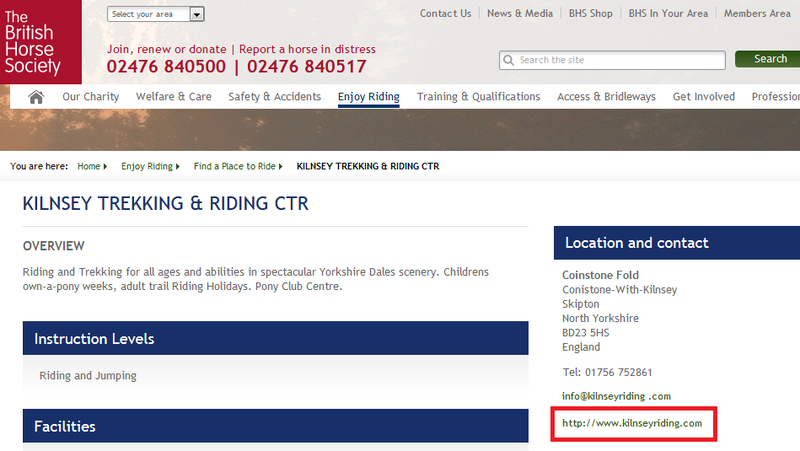 In this case kilnseyriding.com has an excellent listing on The British Horse Society website with a brand DoFollow link. 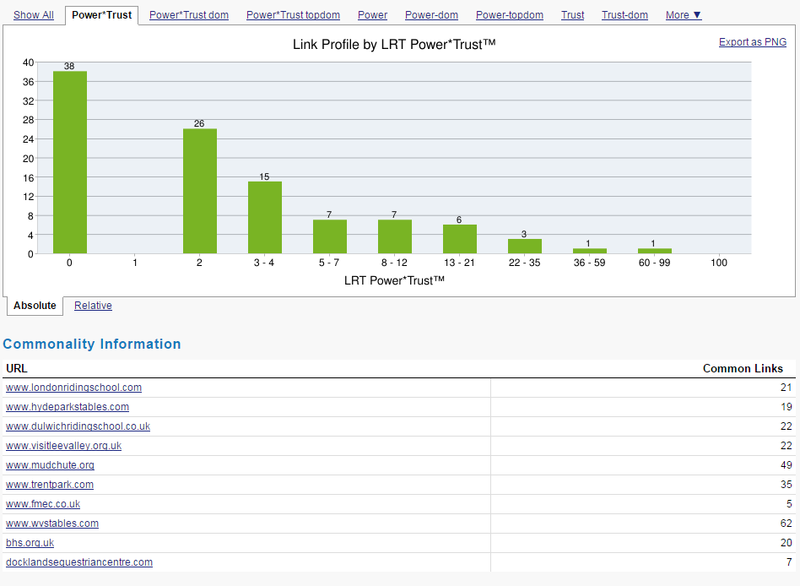 Although the listing page has a Power*Trust = 0 the domain looks superb in a QBL report with a Power*Trust = 35. It is also great to see a domain where the LRT Trust™ is higher than the LRT Power™. This is the sign of a domain with very good backlinks, to get a link here is excellent. A quick look at the Common Backlinks Tool results table shows that KilnseyRiding.com has 19 common backlinks which have a total Power*Trust = 76, so this means the average Power*Trust/Common Backlink = 4. If we use the same process as we did with KilnseyRiding.com we find that the most powerful backlink that GilliansRidingSchool.co.uk has is from locallife.co.uk. There are actually 13 links here, 3 DoFollow and 10 No Follow. All links have a Power*Trust=0. The directory has many additional features such as receiving leads by email, sending SMS offers and the ability to schedule appointment reminders by SMS. 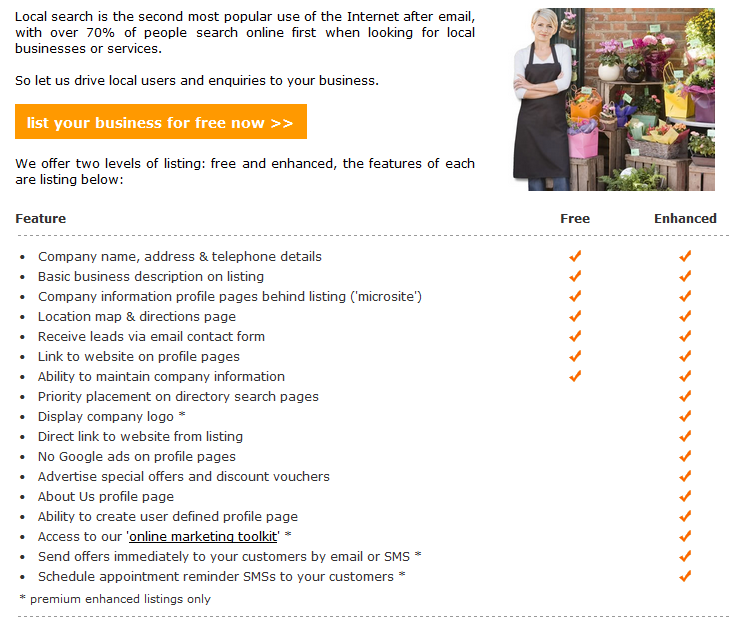 It looks like locallife.co.uk have quite a nice business model, but at the end of the day this is not a natural link. The QBL domain looks very good with a Power*Trust=25, but having more LRT Power™ than LRT Trust™ is not as good as KilnseyRiding.com's excellent link from The British Horse Society. A quick look at the Common Backlinks Tool results table shows that GilliansRidingSchool.co.uk has 9 common backlinks which have a total Power*Trust = 21, so this means the average Power*Trust/Common Backlink = 2.34. This figure was 4 for KilnseyRiding.com. From the brief analysis of our examples, it seems that it is certainly a good idea to look for backlinks that your competition already has. The obvious tool to use is the Common Backlinks Tool as we did above. You can sort the table by Power*Trust and work through the grid to find links that you could get. But there is another tool that is perfect for this job too. The Missing Links Tool works in a very similar way to the Common Backlinks Tool, but this time you can enter your own domain and then look for the common links that your competitors already have, but you don’t. You can input 10 competitors. To demonstrate the Missing Links Tool we will select the example with the lowest estimated traffic cost, GilliansRidingSchool.co.uk. When setting up the Missing Links Tool you have a choice of using the Quick or Detailed Analysis modes. The ‘Quick Analysis’ Missing Links Tool will work in an ad-hoc query mode without validating the links. The trade off here is speed vs. accuracy. I prefer to use the Detailed Analysis so that I am looking at the freshest data possible. 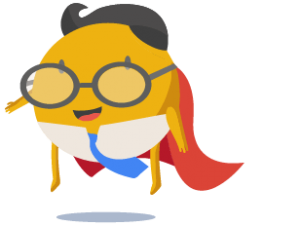 You can enter either your competitor’s domains or specific page URLs. 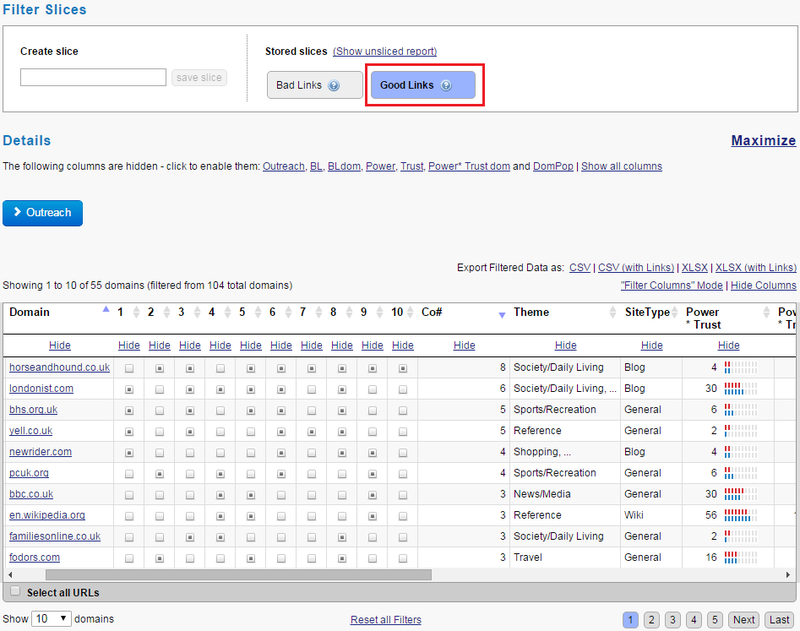 In this example it makes most sense to look at domains, as we are not expecting to find thousands of common backlinks. In a highly focused niche, where you suspect there may be lots of common backlinks, it may be better to analyze the page backlinks instead. The Missing Links Tool Results show histograms for various metrics of the common backlinks and a table of the Commonality Information. It is great to see a nice wide spread of Power*Trust for the common backlinks, so there must be some great opportunities in there. To make things super easy, there are two pre-defined Filter Slices, ‘Good Links’ and ‘Bad Links’. So now we have 55 domains that have common backlinks to our competitors. 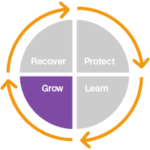 In each case we can click on the point on the grid to launch a QBL report for the relationship between the domain and the competitor’s domain. Lets quickly go through the first ten in the order of the highest Commonality (Co#). which was an excellent article with a link to Hyde Park Stables. A link like this is not easy to get, it is very natural but would probably take some serious schmoozing to get if you were not the best stable in London. This a DoFollow link in a forum to Dulwich Riding School. With a bit of imagination it would not be at all difficult to get a link like this. I would guess that a polite phone call or email to the author, Sam Parton, would help here. He was quite happy to link to some central London riding stables, so to also mention one in the North West of London would surely add value to his post? There is also an ‘Advertise With Us’ section of londonist.com that could be considered. There is a section on bhs.org.uk about becoming BHS Approved. If I had a UK based equestrian business I would do everything I could to get their seal of approval and a link on their site. There is also an ‘Advertise With Us’ section of bhs.org.uk that could be considered. You can sign up for a free listing at Yell or pay for a ‘Prominence Advert’ if you wish. This is a very easy link to get. I would suggest that this would be a very good move for an equestrian business. The BBC is not considered an easy place to get a link at, but because their site is so vast it can be easier than you think. I managed to get a BBC link to a lead generation site that I own, by speaking on a BBC Local Radio show. If you are planning an event it is worth getting in touch with your local BBC Radio Station, they are much more approachable than you might imagine. Good luck with this one, it might not be easy but if you can do it will be very worthwhile. Families Online is a website and 34 local paper magazines that has been supporting families and local businesses since 1990. This is a page called ‘SPORTS LISTINGS A-Z in south west London 2014’ – so why not contact Joanna Parry who compiled the page with some ideas for a 2015 version? You would of course include your link. There is also an ‘Advertise With Us’ section of familiesonline.co.uk that could be considered. If you represent a commercial business (e.g. travel agency, hotel, airline) or charitable organization, please post the URL to the relevant site in your member profile instead of linking to it in your posts. If you obey these rules you can still get a link, albeit No Follow, on Fodors.com. In this article we have seen that common backlinks really do matter. Powerful, on topic common backlinks certainly seem to directly affect your bottom line: the amount of money you make. If Google’s results are to get better, they must provide results that are relevant to search queries. 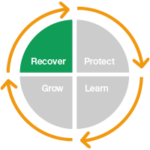 One of the strongest signals of relevance must be from common backlinks. Having similar backlinks to your competitors is a sign that your domain does belong on the SERP with them. Using the Common Backlinks Tool we can easily find common backlinks that are expected in any niche. Using the Missing Links Tool you can find links that your competitors have and try and get some similar ones yourself. This isn’t the easiest form of link building but these tools make the job much easier. Spending time with this kind of advanced link building will certainly pay off, increasing the power of your domain and its relevancy. 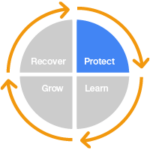 Hopefully your backlink profile is already healthy and looks natural, now it can be highly relevant too.